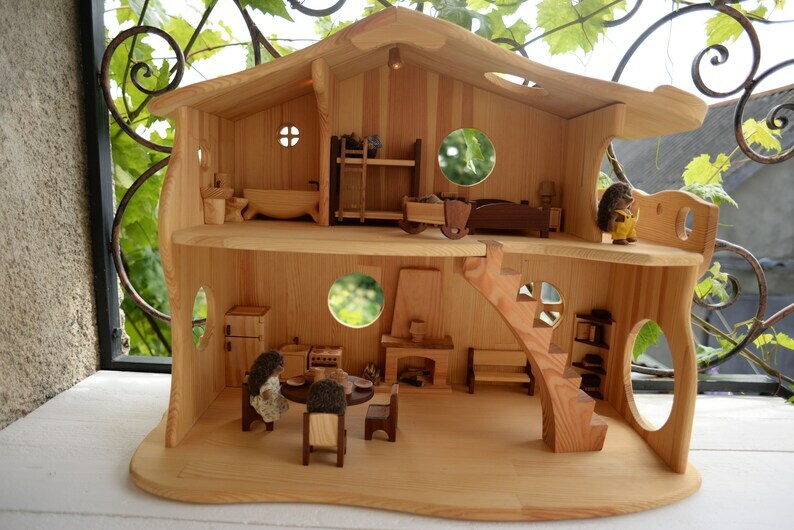 If you are searching for a Hobbit wooden-dollhouse we have created something very special, just for you! This two-story Wooden dollhouse with furniture 100% handmade, space for several children to play together, and charming details, such as the hand-carved central stairs and fireplace. One of the greatest benefits of having a dollhouse is that they give children endless hours of fun. It is not just the acting out scenes that delight children; it is also rearranging the dollhouse furniture in such a way that it pleases their personal tastes and also allows them to create the scenarios they want. Height 55cm/23in, length 70cm/27,5in, depth 35cm/14in . This house is made by the best masters with all the features: it is solid and will not fall apart when a child plays, rounded edges hold a bunch of toys. I got this for my 3 year old granddaughter's birthday and she loves it! I could not be happier! It arrived quickly to the US, and was packaged with great care. The little house is just perfect - beautiful craftsmanship, amazing attention to detail, and very unique. I can’t wait for my kids to open it! And I expect it will remain in our family and loved by generations to come. Thank you so much! So wonderful! Beautiful work, sturdy, amazing. Tracked it as it came from Ukraine and customs and to our door. Securely packaged and padded for the long trip. The dollhouse is beautifully designed and well executed Finish is perfect. Details are amazing. The little house is really wonderful. It is made with so much love for every detail. I had to wait for only two weeks until it was produced and one more day for the transport to Germany. Thank you very much! It is a very, very good Shop!